From a Colombian coal mine 60 million years deep, scientists uncovered remains of the largest snake in the world, Titanoboa cerrejonensis. Measuring 48 feet long and weighing in at 2,500 pounds, this massive predator could crush and devour a crocodile…and he’s coming to Fruita! 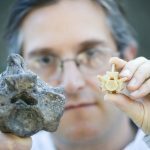 Museums of Western Colorado’s Dinosaur Journey will host Titanoboa: Monster Snake, presented by the Smithsonian Institution, May 19 through August 5. The exhibition is traveling to 15 cities on a national tour with a full-scale model of Titanoboa and paleontological evidence that delves into the discovery, reconstruction and implications of this enormous reptile. The exhibition results from a collaboration of Florida Museum of Natural History, the University of Nebraska and the Smithsonian Tropical Research Institute, and has been organized for travel by the Smithsonian Institution Traveling Exhibition Service. Titanoboa is being brought to Dinosaur Journey through local sponsorship by U.S. Bank, FCI Constructors Inc., and Chadwick, Steinkirchner, Davis & Co, PC. 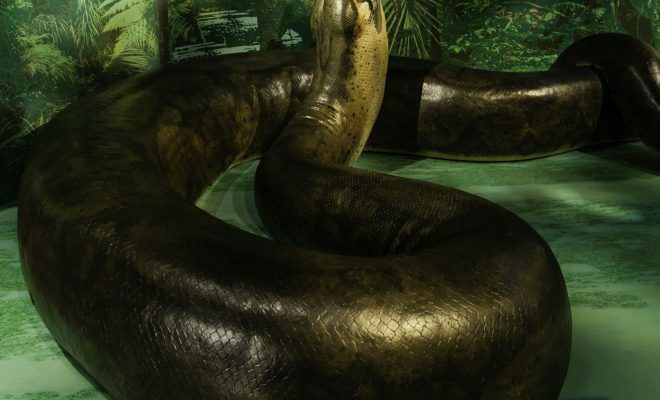 Titanoboa: Monster Snake opens to the public on Friday, May 19 at 9 a.m. “And, in recognition of National Museums Month in May, that will be a free day at Dinosaur Journey – provided by Alpine Bank – to make sure everyone has the opportunity to experience Titanoboa,” says Booth. The Smithsonian Channel documentary Titanoboa: Monster Snake will be shown at Dinosaur Journey throughout the tenure of the exhibition and is included with museum admission. The 53- minute film follows scientists to the mines, into the labs and on an expedition that delves into the life of this enormous reptile: How did it live? What did it eat? And how did is grow this big? Dinosaur Journey is located in Fruita, just south off of I-70. The museum is open seven days a week, 9 a.m. – 5 p.m. for the duration of the Titanoboa exhibit. For further information: www.museumofwesternco.org or Dinosaur Journey, 970-858-7282. Next Story → Good enough to eat!